Ex-Wales fly-half Jonathan Davies wants to see Perpignan's James Hook start at centre against Argentina. Wales, already missing Jamie Roberts, will be without centre Jonathan Davies for the remaining autumn Tests. The 25-year-old suffered a pectoral injury against South Africa and Scrum V pundit and namesake Davies says Hook is the man to partner Scott Williams. 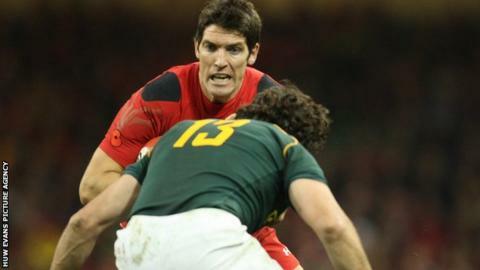 "It might be an opportunity to put James Hook in there for a little bit more creativity," Davies said. "Ashley Beck is an option of course, but for me he's [Hook] been playing well out in France and he is a natural rugby player. "Sometimes you need that little bit of creativity and I would start with Hook and Scott Williams." Hook and Beck were early replacements for Scarlets pair Davies and Liam Williams, who suffered injuries in the moved that led to South Africa's opening try. Jonathan Davies says namesake Davies - or JD2 as some Scarlets fans know him - will be a big loss for Wales, but thinks Hook - who came on at full-back against South Africa, with Leigh Halfpenny moving to the wing - should replace him in the Welsh midfield. "I thought he [Hook] played well [against South Africa] and he deserved to have a spot," pundit Davies added. "We have to create and score tries against these types of sides. "I would like to see Leigh Halfpenny hitting the channels out wide again and maybe that's an opportunity now with James Hook to create those spaces." Gwyn Jones, the former Wales flanker and captain, believes head coach Warren Gatland will select Ospreys' Beck alongside Williams in the centre. "I think Warren will probably stick with Beck as a centre," Jones told Scrum V.
"I think he would probably want Halfpenny at full-back and I think Hook may miss out again. "I think he plays well in open, loose games where he's just reactive to what's coming at him and he does have great instinct. "But playing at 12 where you have more control…. he could definitely do it, but whether Warren wants him in that position, I doubt. "I think he's too good a player not to be taking part at some point, especially if it gets loose later on in the game." Another option could be to move wing George North to outside centre, but former Wales captains Jones and Davies both believe the Northampton player needs to be more involved from his usual station rather than starting in midfield. "I think the template for George North is someone like [former All Blacks wing Sitiveni] Sivivatu at Clermont [Auvergne], who just wanders the pitch," Jones said. "He gets in the game and he's in it regularly and must have 20 carries a game. "Rather than waiting and be dependent on the ball reaching George North on the wing he has to come and look for it. "He's still young in his career and these are difficult things to leave your wing and go searching for the ball because you might always be exposed for doing it. "If he's not quite up to doing that yet we need to engineer him into the game."